Containers are a major disruption in application technology, and as any new technology present new security challenges. Aqua researchers have identified two sophisticated attack vectors that target developers: we call these 'Host Rebinding' and 'Shadow Container' attacks. 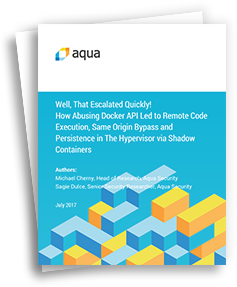 In this paper, which was presented on stage at Black Hat USA 2017, we describe the progression of a multi-stage attack in detail and recommend steps developers need to take to secure their containerized environments.